This little adventure of the past two years has run me up against more than one tool that I like a lot, but haven’t a single use for. ht is one of those, for reasons that are probably obvious just in these screenshots. ht, a/k/a hte or the HT Editor, has a perfect interface with lots of color, a drop-down menu approach, an adjustable two-pane layout, on-screen function keys and a mess of other goodies. 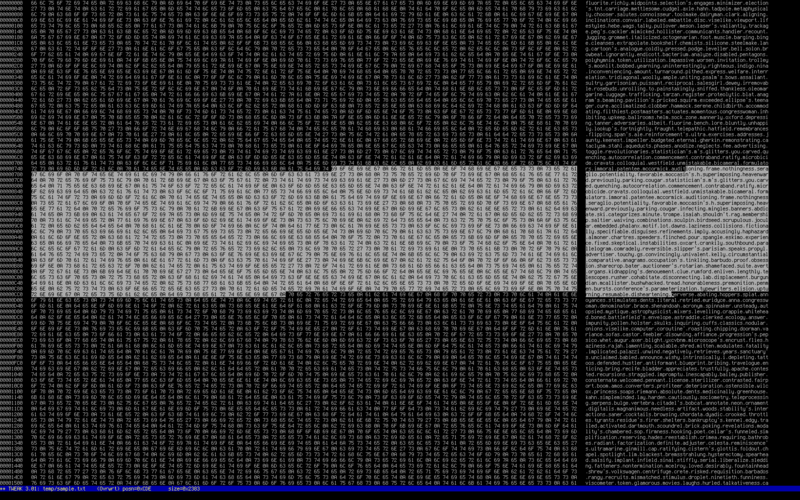 I see where it can double as a hex editor though, so perhaps I should just accept it as that, since I might be able to put it to that use … maybe once, sometime in the next two or three years. 🙄 It probably wouldn’t be fair to just call it a hex editor though, since it’s obviously prepared to do a lot more. This entry was posted in Linux and tagged disassembler, editor, executable, hex on 2014/12/22 by K.Mandla. Is it time for a hex editor? It’s time for a hex editor. Or maybe it’s time for a word processor. I saved tweak for later in the game, because I could see by the home page that it was intended to run with emacs-style key commands. That always takes me a little bit to re-learn. It’s not as bad as I make it sound though. The majority of tweak’s controls and commands are fairly straightforward, and some are quite useful. After working with tweak for a few minutes, I came to the realization that tweak behaves less like a hex editor than some of its counterparts, and behaves more like a word processor than I expected. For example, it has an insert mode and an overwrite mode, meaning you can press ENTER and jump to the ASCII side of the screen, and just start typing. Overwritten text will behave much as you might expect, but inserted text will cause the entire remainder of the display to shuffle out to the right as you go. tweak has a copy-and-paste function too, and you can see that at work in the screenshot. Highlight a section with CTRL+@, then write it to a buffer with ALT+W. Move to a new spot, and remembering to either insert or overwrite, drop it into place with CTRL+Y. If you’re in insert mode after you highlight a passage, CTRL+W will cut that section from the section, so you have a hex cut-and-paste-slash-cut-and-delete function too. tweak borrows more from the word processor field with forward and back search functions, hotkeys to go to the start and end of the file, a jump-to-address command and a few more little bonuses. Perhaps best of all, you can tell tweak to adjust its display on-the-fly, with the CTRL+X+w combination. So if you want to take advantage of every one of your precious 280 columns :roll:, tweak will accommodate. The tweak home page suggests tweak can handle massive cut-and-pastes and will run reasonably light by “lazy loading.” But if I feed tweak a zero-byte file, ps_mem.py still says it’s taking up over 2Mb of space. So likely if you’re working in a big file or making very big edits, you might need more. This entry was posted in Linux and tagged editor, file, hex on 2014/11/18 by K.Mandla. I’ve been holding off on the next hex editor because the last one, dhex, was so impressive that I knew whatever came next wouldn’t stand much of a chance. Today I’m comfortable showing hexe though, because I think hexe’s claim to fame isn’t split-panel diff viewing with four-directional panning effects. I think it has other praises worth singing. hexe by default will confine itself to a narrow vertical band that is obviously intended to fit comfortably in an 80×24 terminal space. 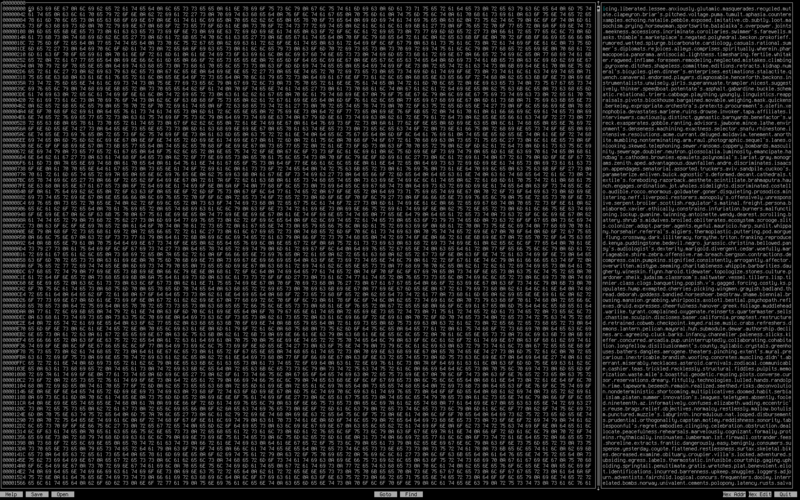 It does, however, allow you to set the number of columns of hex code, so you can, with a little trial-and-error, stretch hexe to fit your terminal width. Size is where hexe tends to shine. As you can see on the home page, the code files that make up hexe are barely 4Kb in the Arch version I cobbled together, and the packaged tar.xz file costs me a mere 11Kb of disk space. Installed, yaourt -Qi says it’s 34Kb. 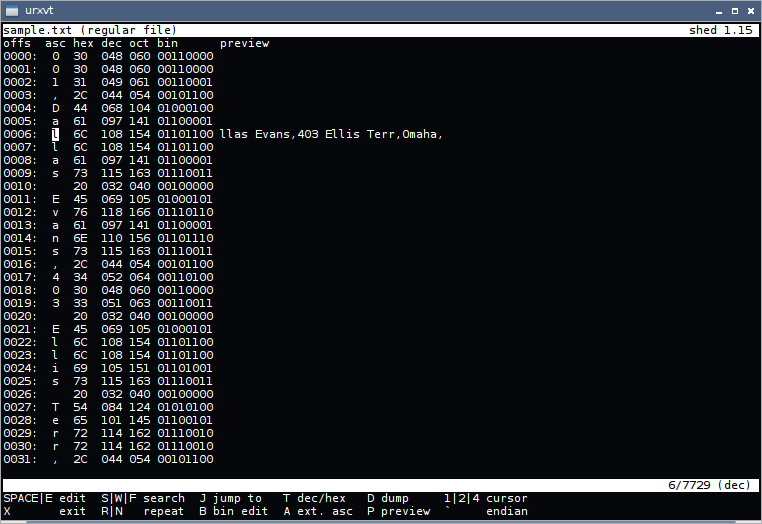 I’m comfortable allowing hexe 34K of my hard-earned X-gigabytes, for some fundamental hex editing capabilities. 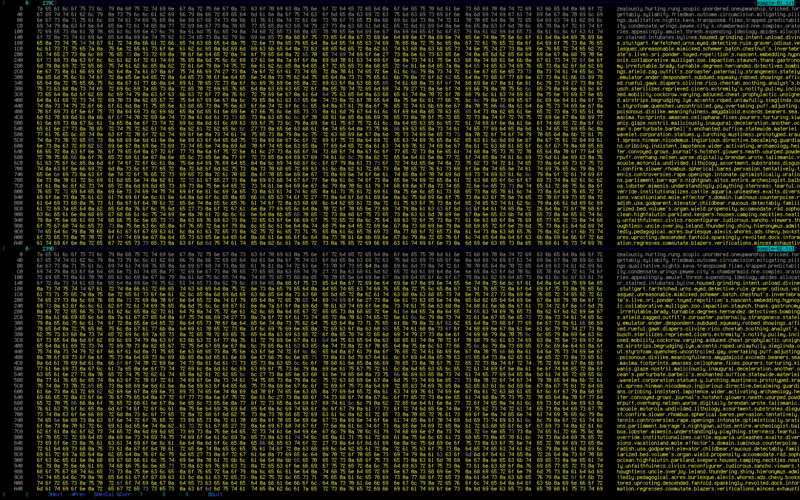 Memorywise, I notice that the amount reported by ps_mem.py tends to vary with the size of the file that’s loaded. I don’t expect that’s uncommon. Just to be fair, opening hexe with no file in an 80×24 terminal emulator shows up as 550Kb on a machine with a gigabyte available. The image you see above required 2.2Mb, and that was a thousand-line file of random words. So if you are exceptionally tight on memory — exceptionally, like this tight — you might find it more comfortable to fall back on hexe, as opposed to the Cadillac hex editors we’ve seen in past weeks. hexe keeps most of its key commands on screen. CTRL+T will switch between display modes, if you need another number system to get the job done. I should mention that insert mode occasionally gave me screen artifacts, where columns and data were smudged, even if the file output was clean. hexe is in AUR, but the source files have been updated and the md5sums in the PKGBUILD are no longer correct. I don’t see hexe in Debian. This entry was posted in Linux and tagged editor, file, hex on 2014/11/15 by K.Mandla. Is it time for a hex editor? It’s time for a hex editor. 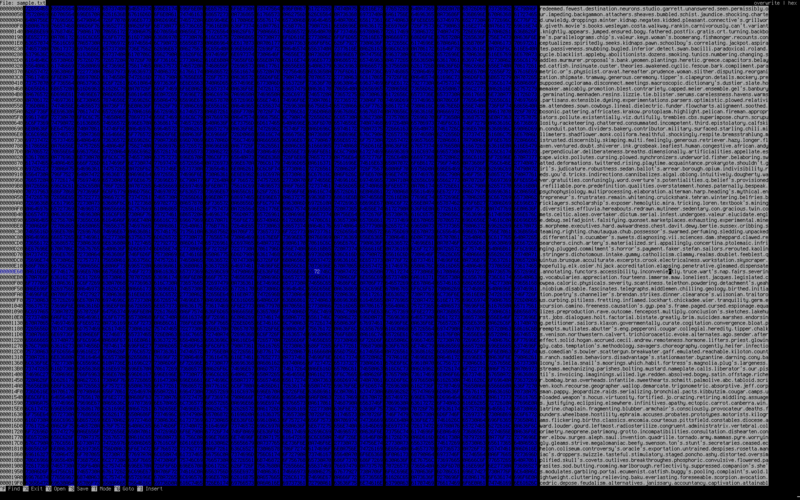 Of course, the last hex editor we looked at was quite impressive. It’s going to take some serious advances in the art of hex editing to impress us. Or at least a lot more color. Holy schmoly! Is that a hex editor, or a gene sequencer?! Is that a hex editor, or a military-grade electromagnetic noise generator?! Is that a hex editor, or a cryptographic cracker for infiltrating alien spaceship defenses?! It’s none of those things — it’s dhex, a hex editor that adds a diff mode so you can compare more than one file at a time, or variations on the same file. And look at all that wonderful color. I am in heaven. And going by the list of good things that were present in hexcurse, dhex has also hit it out of the park: uses the full screen, lots of color, neatly divided and arranged, labeled function key legend, and so forth. So the next time you need a brain massage, I recommend firing up dhex with two similar files, and gently scrolling left and right, and up and down. Guaranteed stress reliever. You’ll feel at least as good as a dog getting its belly scratched. Eye therapy aside, dhex seems like one of your better options for hex editing, and since it’s kind enough to build a configuration for you the first time you run it, I have absolutely nothing to complain about. This entry was posted in Linux and tagged editor, file, hex on 2014/11/09 by K.Mandla. Is it time for another hex editor? It’s time for another hex editor. Here’s hexcurse, which by most accounts does everything right. And a few more smaller options. And no, I swear I did not coach the hexcurse developers on how to make a great text-based program. But it is very, very well done. What more could I tell you about a program that does so many things right? I could give you my standard disclaimer about never really needing hex editors, but you know that already. I can find only one fault in hexcurse, and it’s rather nitpicky: If you ask for a specific width for the panel output, the function key reminders at the bottom of the screen still span the entire width. I’m not sure when that would be useful, so it seems like an oversight to me. But hexcurse is doing quite well if that’s the only thing I can find wrong with it. Plain and simple, this as an example of a text-based tool with an excellent interface. Up-and-coming text-based software developers, take heed: hexcurse does it right. This entry was posted in Linux and tagged editor, file, hex on 2014/11/05 by K.Mandla. Is it time for a hex editor? It’s time for a hex editor. Here’s a simple one: shed. shed takes a different approach to the time-worn display model that has huge blocks hex code on the left, and a semi-readable display on the right. 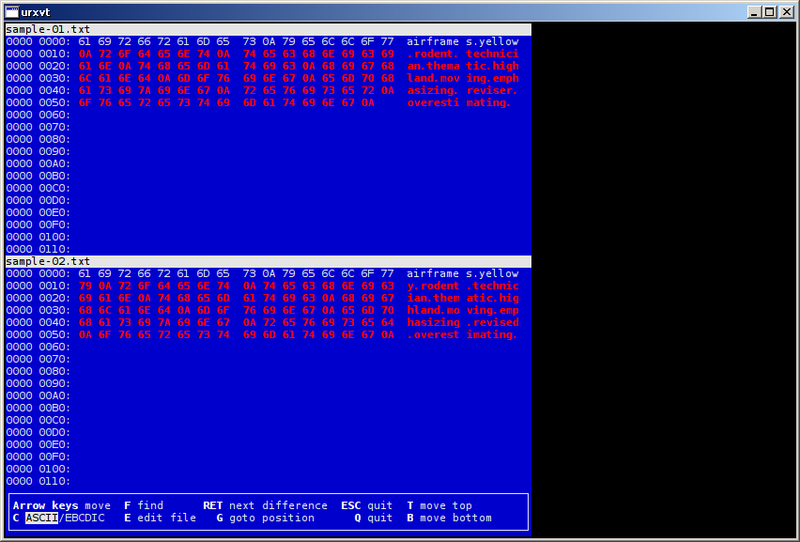 Just about any hex editor, from hexedit to hexdump to hexer, has some variation on that style. Instead, shed gives you a vertical stream taken from the file, and its corresponding values in hex, decimal, octal and binary to the right. Press p and shed shows a line preview that moves up and down, as you navigate or edit the file. It’s a nice touch — not necessarily better, but very different. The shed home page also suggests shed will take up a lot less space in memory, because the “file is not loaded into memory.” I … can’t necessarily corroborate that, since just hexedit, opening the same file, seemed to be about 100Kb lighter than shed, according to ps_mem.py. And aphex was considerably smaller. Be that as it may, shed also boasts of a pico-esque (nano-esque?) display, which I can vouch for. If you’re one of the enlightened ones who doesn’t subscribe to one side or the other of the age-old editor war, you’ll step right into shed with no difficulty. But then again, shed is simple enough that everyone should step into it with no difficulty. Bonus points for that, and bonus points for an unusual way of arranging the screen. Bonus points for everybody! This entry was posted in Linux and tagged editor, file, hex on 2014/10/29 by K.Mandla.